For the greens try going for assorted baby lettuces. I always have fresh arugula in the fridge and that worked really well. Arugula gave the dish a nice peppery finish. The recipe below makes 4 servings. In a small skillet (8-inch skillet) boil the wine and shallot over moderately high heat until reduced to 1/4 cup, about 10 minutes. With a mesh strainer, strain the wine to remove the shallots and return wine to skillet. Reduce heat to medium. Gradually add butter to skillet and whisk constantly on and off the heat until the sauce is creamy. Remove from heat and whisk in the soy sauce. Lightly season with salt and pepper to taste. Light a grill or iron skillet to high heat. Remove excess moisture from fish by rolling it in a paper towel. Brush the cod fillets with olive oil and cook the fish over high heat, turning once, until lightly charred and just cooked, about 2 minutes each side. In a large skillet, heat 1 teaspoon olive oil over medium-high heat. Add the lettuces and toss until just wilted about 30 seconds. Divide the lettuces onto plates and top with the fish. 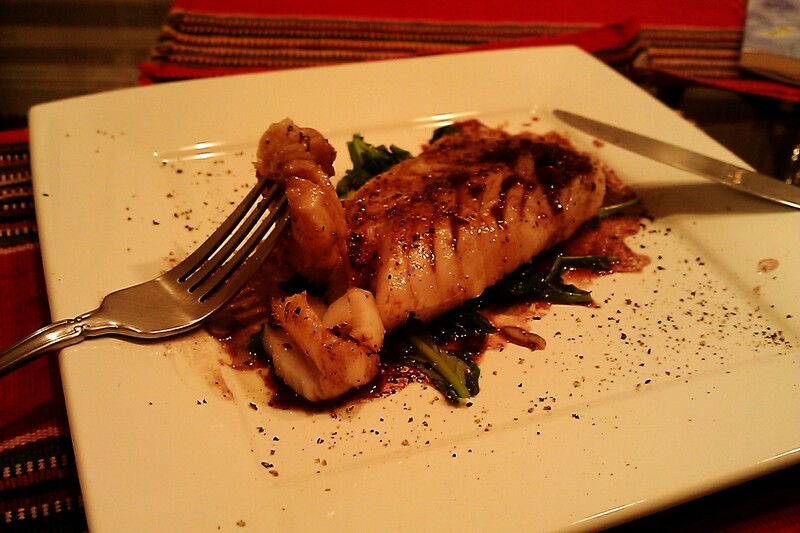 Re-heat the wine sauce, whisking over moderate heat until hot, then spoon the sauce over the fish and serve. Why, thank you! Oh this is a nice one. I’ve made it for guests before and it was a hit. Fresh cod is always available in our market and your cod dish sounds delicious. Thanks, Karen. I made it again last night for dinner to entertain our guest. It was good! Likewise, Karen. Thank you for the thoughtful wishes! That looks delicious. I have to find a new market for fresh fish since the one we usually shop at has had some very pathetic looking fish lately. I like mine right off the hook … or at least not all gray & dry looking. It was … it’s definitely one of those “to make again soon” recipes. This looks wonderful. I love arugula as well.